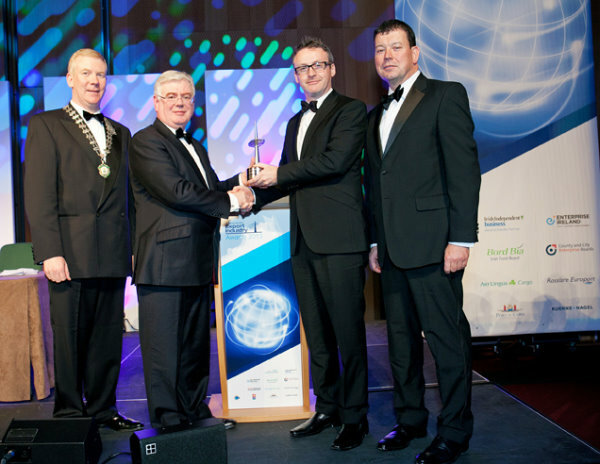 On Friday November 22nd Intel Ireland won the Innovation Exporter of the Year accolade at the Exporter of the Year Awards 2013 which were held at the Dublin Convention Centre. The Export Industry Awards are organised by the Irish Exporters Association (IEA) to recognise the tremendous achievements of companies working in the industry who have helped the export-led recovery by boosting Ireland’s total exports of goods and services to an all-time high of €180 billion in the past year. The Innovation Exporter of the Year Award 2013’, which is sponsored by AIB, is presented to companies that have made a significant innovative contribution to exporting resulting in a new technology, product or service, or a new use for an existing product. Intel Ireland received the award for the design of the Quark microprocessor, a low-power, small-core product which will extend Intel architecture into rapidly growing areas – from the Internet of Things to wearable computing in the future. Designed in Ireland, the Quark SoC X1000 is a 32-bit, single core, single-thread, Pentium® instruction set architecture (ISA)-compatible CPU, operating at speeds up to 400MHz. “Despite the international market challenges faced by exporters in recent years, total exports in 2012 reached a historic high of €182 billion – some 16 per cent higher than their pre-crisis levels in 2007”.